A marketing plan is a structured approach for supporting your business plan. It describes exactly what you will do to market to customers, prospects and influencers. It describes how you will satisfy your customers’ needs with your services and products and outlines how you will reach and persuade them about your brand advantages. The marketing plan can be quite short as long as it includes clear objectives and how you’re going to achieve them. 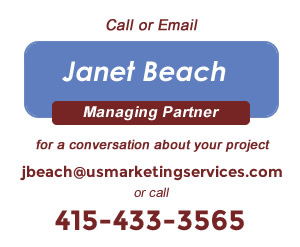 US Marketing Services can help you update or improve your existing marketing plan or write one for a new product or help you with an initiative you have insufficient time or people power to manage as effectively as you want. A marketing plan from US Marketing Services helps you define priorities, set realistic and measurable goals, clarify what you intend to use as a measure of success and includes budgets and action plans, timing and how you are assigning responsibilities. The plan you crafted for us and with us, was a great thinking process for the team and sped up deciding on our top priorities. You made everything so much easier to communicate internally and externally .You thought of so many things we had not had time to focus on until now. Now we are ready to get going and be more successful. Thank you!